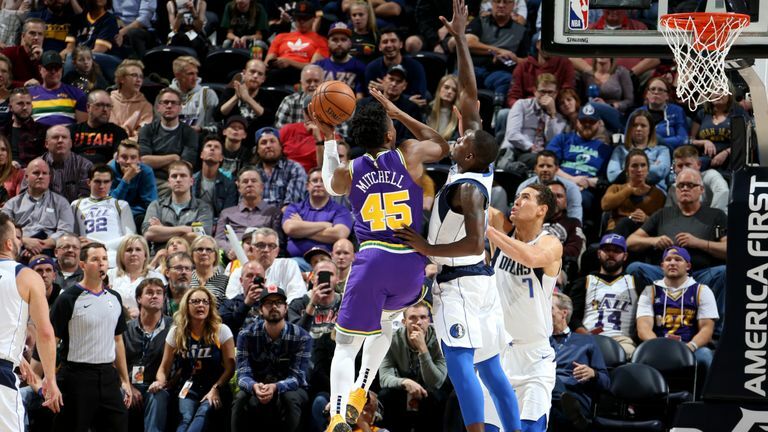 Donovan Mitchell threw down a ferocious one-handed dunk as the Utah Jazz beat the Dallas Mavericks 117-102. Mitchell, winner of the Slam Dunk contest at last season's All-Star Weekend, took to the skies in style in the dying seconds of the second quarter. Having beaten Mavs' guard Luka Doncic off the dribble, Mitchell drove into the paint before elevating over Dallas' German forward Maxi Kleber to ram home a huge right-handed slam that brought the home supporters to their feet. Mitchell finished the game with a team-high 23 points as the Jazz coasted to their first home win of the season.